Never before offered! 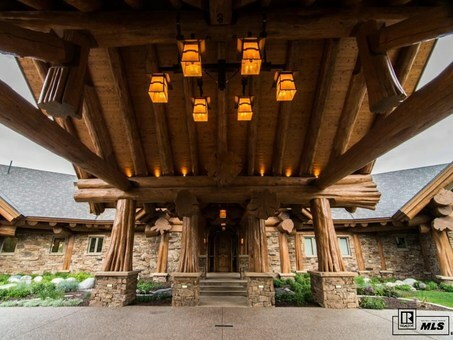 Just as the Bald Eagle is aptly named for being a “magnificent” bird of prey and “distinctive” with the white head and tail feathers, Eagles Landing is a magnificent custom designed Pioneer Log Home of British Columbia, Canada, known as the supplier of the “Finest Log Homes in the World”. The distinctness, size and use of the logs is breathtaking. This home is for those who appreciate and demand excellence in architecture. There is no other home in Colorado like it! 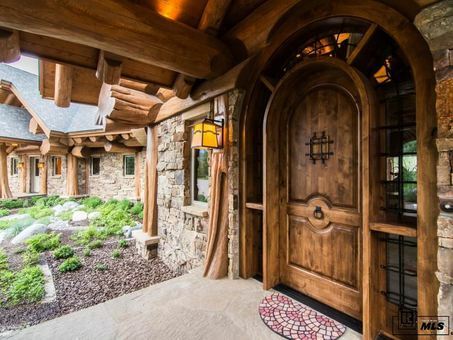 Like Routt County, CO itself, this home honors its world-class setting with style and ambiance. 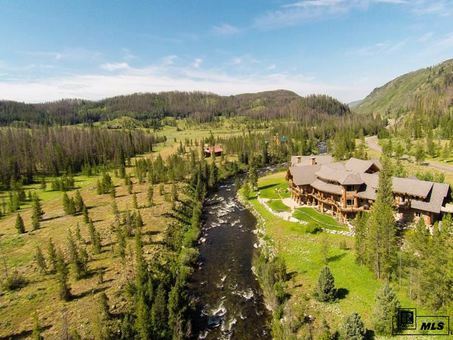 The home is built solidly along the banks of the Elk River in Clark, CO, at the gateway to the magnificent Mount Zirkel Wilderness Area and just 25 miles north of the world-renown Ski Town USA, Steamboat Springs, CO. Unlimited opportunities await the recreational enthusiast. The Routt National Forest forms the north and east boundaries of the neighborhood and provides recreational opportunities in nearby California Park, Diamond Park, Big Red Park, Hinman Park and the Mount Zirkel Wilderness Area. Additional near-by natural amenities include Steamboat Lake State Park, Pearl Lake State Park and Hahn’s Peak. Whether indoors or outdoors, the setting is intimate yet accommodates large gatherings comfortably and in style. The home is dynamic, yet thoroughly cozy, inviting and serene. The property encompasses 3.26 riverfront acres (both sides of the river), with an additional adjoining 15.5 acres available. 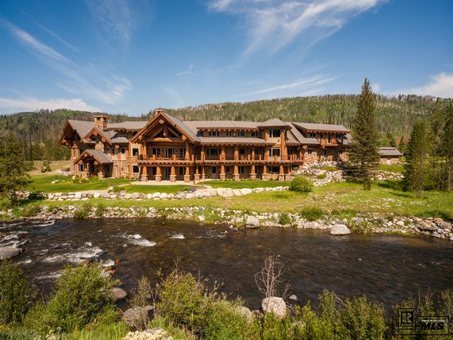 Special amenities of this grand western-style log home include 17, 156 sq. ft. with a generous main floor Master Suite finely equipped with custom built-ins, exquisite bath, two walk-in closets, and floor to ceiling stone fireplace; 6 guest bedrooms, additional 7.5 baths, den, library, recreation room with wet bar and floor to ceiling stone fireplace, fully equipped home theater, 4 additional fireplaces, gourmet kitchen with state-of-the art appliances and pantry, formal dining room, breakfast nook, laundry and pressing room, mud room, storage, wine cellar, sound system, security system and state of the art climate controlled heating and air conditioning. 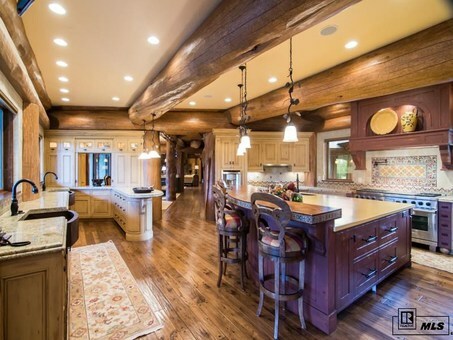 Custom rustic hand textured tongue and groove applied peg end wood floors grace the home. Owners and guests to this grand home are welcomed with a gated and paved driveway leading to the 1476 sq. ft. 3-car radiant heated garage, and impressive porte- cochere at the main entrance. There are professionally landscaped gardens and patios, two small porches, a covered deck off of the master suite and a large back deck extending the length of the home overlooking the river. All of the exterior decks, walks, porches, porte-cochere and area in front of the garage have heat for snow melt. There is a separate full house generator building conveniently built adjacent to the garage. No detail has been overlooked with custom and extraordinary details and finishes found throughout!